MyCRM Blog | Instantly improve your day by visualising your appointments on a map, and get organised for once! Instantly improve your day by visualising your appointments on a map, and get organised for once! The old saying “a picture paints a thousand words” is never really argued against for a good reason. Well never has this been truer when it comes to being able to visualise appointments on a map view in Dynamics 365 and CRM. For many of us who use Appointment activities, it is all too often the case that our daily schedules can become overloaded with activity, which in some cases can lead to overruns and errors calculating the travel time from one appointment to another and so on. What we really do need is a simple way to be able to clearly see where our appointments are geographically located, and also wouldn’t it be great if a system could simply work out the travelling route and duration of time needed. With MyGeoMap for Dynamics 365, being able to do just this becomes simple as MyGeoMap includes the ability to view all appointments on a map view, and also allows users to simply select the appointment on a map to add it to a route planner. The route planner will calculate and report on the journey time by making use of its build in itinerary, which can be printed or emailed out. For those people who want to be “organised”, MyGeoMap will help them to arrange their schedule of appointments to make best use of their time by planning around the best logical travel routes. Anyway, enough about planning routes brilliance, let me get back to visualising appointments. This is important for several reasons. Firstly, it instantly provides a user with the ability to clearly identify where they are planned to be and where any windows of inactivity occur, which they may want to exploit. Secondly, being able to look forward using the in-build calendar search, allows users to look at things either daily, weekly, monthly, or for that matter absolutely any date range they wish to. So, if you really want to see what you have coming up in the next year, or if you want to report back on everything you’ve been doing in the last year, quarter or last month, well you can, simply by selecting all the appointments displayed on the map. The importance of visualisation is to provide a quick and easy understanding of what’s going on. 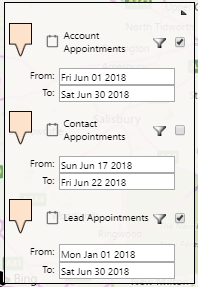 So the next time users are speaking to a customer or prospect that requires a visit, with a quick glance of MyGeoMap Appointments, users can view when they have time to make the visit and importantly, attempt to schedule it based on keeping journey time to a minimum – aiming to book the meeting when already in the area or relevant to a route they’ve already planned. Another great benefit of using MyGEeoMap is to be able to manage other people's schedules and book appointments for them. This is particularly relevant to sales people who have others creating and booking appointments for them, and also for Field Service personnel (engineers) who’s schedules are keenly overseen and managed by a service department’s scheduling team or manager. For Field Service people, all appointments can be clearly identified based on an individual basis or in the case of a team, the overall team’s calendar schedule. The use of filtered views, which are set using Dynamics 365/CRM’s built-in Look Up queries, enables unlimited capability to display appointments on a map view relevant to the CRM query requested. For scheduling engineers, just like for use by sales teams, MyGeoMap eliminates the cumbersome practise of having to cobble together shared calendar views in Outlook, as everything you need to see and manage is within Dynamics 365 and CRM. As good as Outlook is, it is not too clever at allowing users to share and manage calendar views of CRM related activities. Ease of use and providing a major productivity gain is the key outcome of using MyGeoMap. Being able to manage and view appointments is just one of many other elements of functionality that add to the overall benefit of this tremendous add on product. All of our products are now available on subscription. You can as before take trials of any of the productivity enhancements below, by following the links or by just dropping our team an email.